Real Estate is a business of appointments; the real action of Real Estate starts with Methodical Prospecting and must lead to Appointments. The Appointment is where the agent shines or fades. With our local Sellers effective appointments take place at the Seller’s Asset, their Home. You must remember that Sellers view their personal lived-in property differently than their investment rental properties, and your approach and conversations must adjust accordingly. How about Buyers, what are their appointments? Well, it is no longer a physical one, or at least it has been reduced dramatically to the avoidance of meeting with agents. The best next option to in-person meetings you can hope for to start truly working with someone authentic is their Cell Phone Number, more precisely their Text Messaging System. 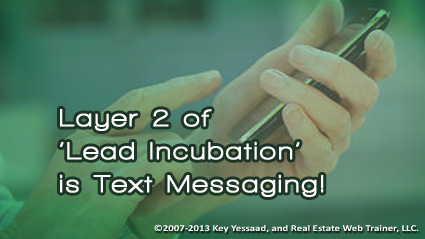 You must learn to incubate your Buyers’ Relationships via Text Messaging – in essence the initial emails must first lead to their Text System; once you are texting back and forth and conversing you have a chance at a sale.